I've been teasing you with sneak peaks of this quilt for waaaaay too long now, but the wedding was yesterday and the quilt has been gifted, so I can finally show the finished product. Can you believe that was all the way back in February? I'm pretty darn good at that procrastinating considering I finished just this past Monday! All that's done now. And I like it, though not as much as I thought I would. It's bluer than I anticipated, but the original had red borders and two blues, both a bit paler than the one I chose. I left the quilt on the gift table last night, as the bride and groom were too busy dancing and having a wonderful time to open gifts. (But that's the norm, right?) I don't know if they had time to open them this morning already either because they headed out early for their honeymoon, but since my hubby works with the groom, I know I'll get some feedback when they return. I also gifted the elephant baby quilt last night, but I'll save that photo and story for another post. Today I hope to work on the pinwheels for the last of the baby quilts in this bunch, but if the hubby says that's too much noise, it's back to the Whig Rose. Your quilt is just awesome!!! All that moaning and groaning to match the points ws worth it! The wedding quilt looks stunning! The quilt is very special, and I'm sure will be much loved by the bride and groom. 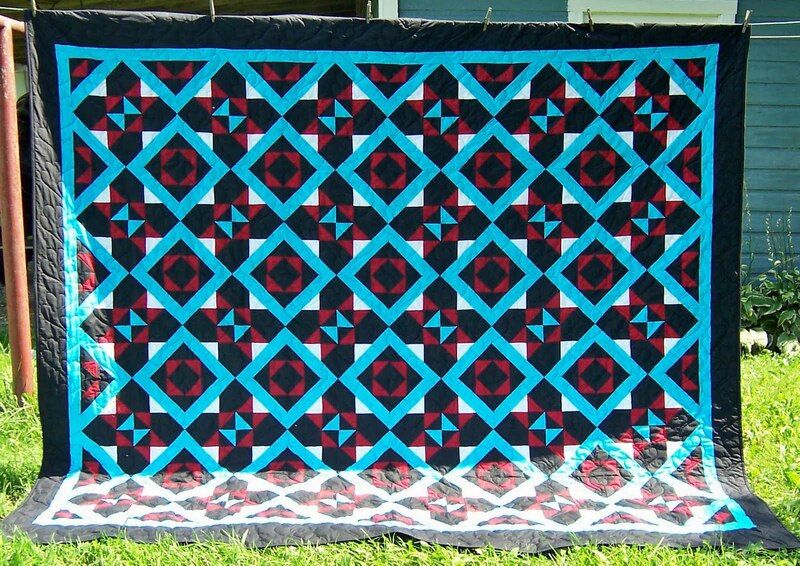 ---"Love"
The quilt is just amazing! Love it! Ah, so that's what it looks like! Lots of little pieces. I would have moaned and groaned too, LOL! It turned out beautifully! I think that your colors are perfect. 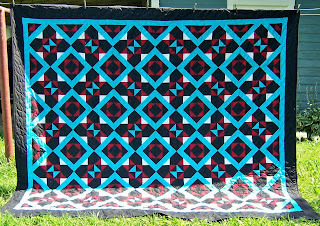 The quilt looks so different all done. I liked it before from the peeks, but it is just awesome. What a great job you did on all those points. They will love it. Ryan and Jess are one lucky couple. The quilting is really lovely, and I love the colours. Poor hubby, indeed! Terrific quilt. They are sure to love it.